(A) MDA-pc3, and MDA-B6 cells were cultured in glass-bottom plates in the presence of 25 nM KX2-391 or DMSO for 72 h and stained with 2.7 µg/mL propidium iodide (PI) in phenol red-free medium. Stained cells were imaged at 200 x magnification using Zeiss LSM 700 confocal microscope and PI-stained cells were counted in at least 10 randomly captured frames. Counts of PI-positive cells were normalized on the total cell numbers in matching frames. The graph shows the ratio of PI-positive cells in KX2-391-treated populations relative to matching DMSO controls. Inhibition of PLCG1 phosphorylation by the silencing of DopEcR, ErGPCR, and Gq and the addition of inhibitors of RTK and Src. 5 µM SU6668 (RTK inhibitor) and 20 µM PP2 (Src inhibitor) were added to the cells for 30 min treatment before the 20E stimulation. Three days postinfection, the permeability of ANDV- and mock-infected endothelial cell monolayers was determined as described for inhibitors at indicated times in the presence or absence of the kinase inhibitor PP1. The percent change in FITC-dextran over controls is presented as a measure of EC monolayer permeability. Data are derived from two independent experiments performed in triplicate with comparable results. Interaction between Src and FAK during ILTV infection in LMH cells. 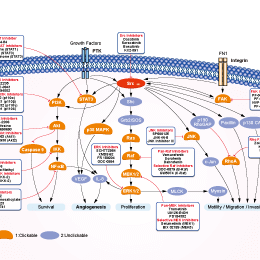 The protein levels of FAK, phosphorylated FAK (p-FAK), Src, and phosphorylated Src (p-SRC) were assayed in LMH cells with or without ILTV infection upon pretreatment with SU6656. β-Tubulin or β-actin was used as a loading control. The intensity ratio between the corresponding bands (upper band/lower band) was determined using ImageJ and normalized to the ratio of DMSO. MLR-1023 is a Lyn kinase activator and a novel insulin receptor potentiator that elicits a rapid-onset and durable improvement in glucose homeostasis in animal models of type 2 diabetes.